It has been discussed where to take the bees when making the test for infestation level of Varroa mites with the Bee Shaker. From a brood frame or just near the brood. 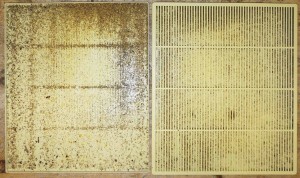 The first week of May, I did a test with the Bee Shaker of a number of bee colonies. After that I inserted sticky boards to collect the natural downfall. 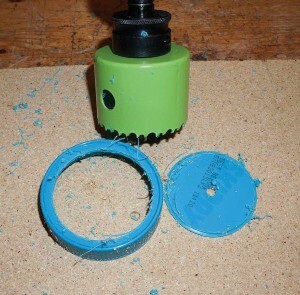 This happened to coincide so that two colonies tested with the Bee Shaker also got sticky boards. 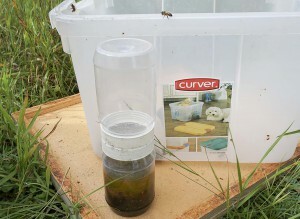 The sample of bees for the Bee Shaker were taken from the middle of a the super just above the queen excluder. A good compromise place to take the beesample from to the Bee Shaker is in the middle of the first super above the queen excluder. You don’t have to look for the queen. Not close to the entrance where the number of mites are fewer than average. And not far awav from the brood, when there are many honey supers. The number seems to vary more there. Those colonies tested were choosen as I had found them to be potential breeders. 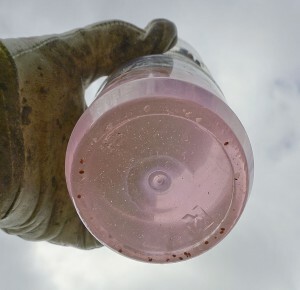 The two colonies mentioned both had one (1) mite in the Bee Shaker out of about 350 bees, ie about 0.3% infestation level. Three weeks of natural downfall thereafter gave 7 mites from one and 8 from the other. The sticky boards covered almost the entire bottom. Let’s say I missed seeing two mites. If so it was thus about 0.5 mites per day. Multiplying this figure with 120 I have heard gives a figure for the total number of mites in the colony. 0.5 x 120 = 60 mites in total then. 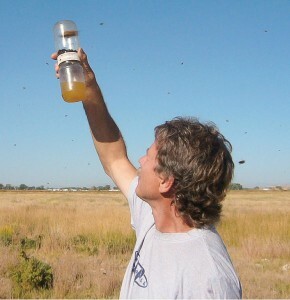 The number of bees in the colonies were at least 30 000. But let’s say it was 30 000. Then 60/30000 would maybe give an infestation rate = 0.2%. But now I’ve seen reports that one should multiply by 30 (20-40). Then it will be completely different figures (in “favor” of the Bee Shaker). Collecting natural downfall should be done during the normal brood period, not in the very beginning or the very end of the brood season. In the case of the natural downfall of varroa mites, mites will also come from mites emerging from brood cells that have hatched during these three weeks. The natural downfall should therefore have given more mites compared with the Bee Shaker if these methods should have given corresponding figures. Therefore, the conclusion should be that the Bee Shaker revealed a greater proportion of the total number of mites in the hives than the natural downfall did. 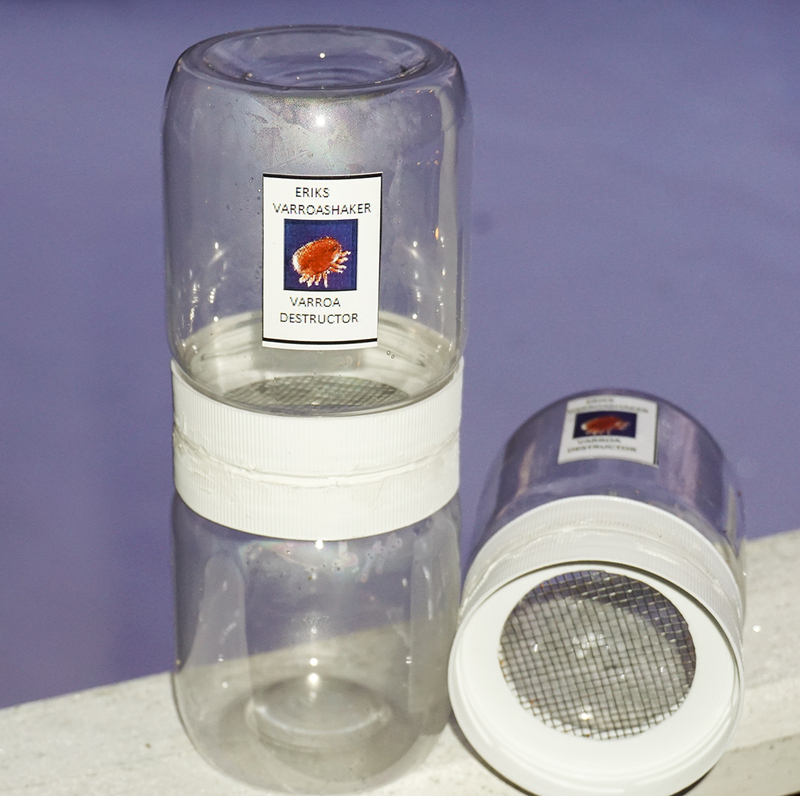 If you want to know the Varroa level in the bee colony this tool is handy. Twice a season can bee good if you use it for example in selecting your breeders. And which colonies need a new queen (high Varroa level). 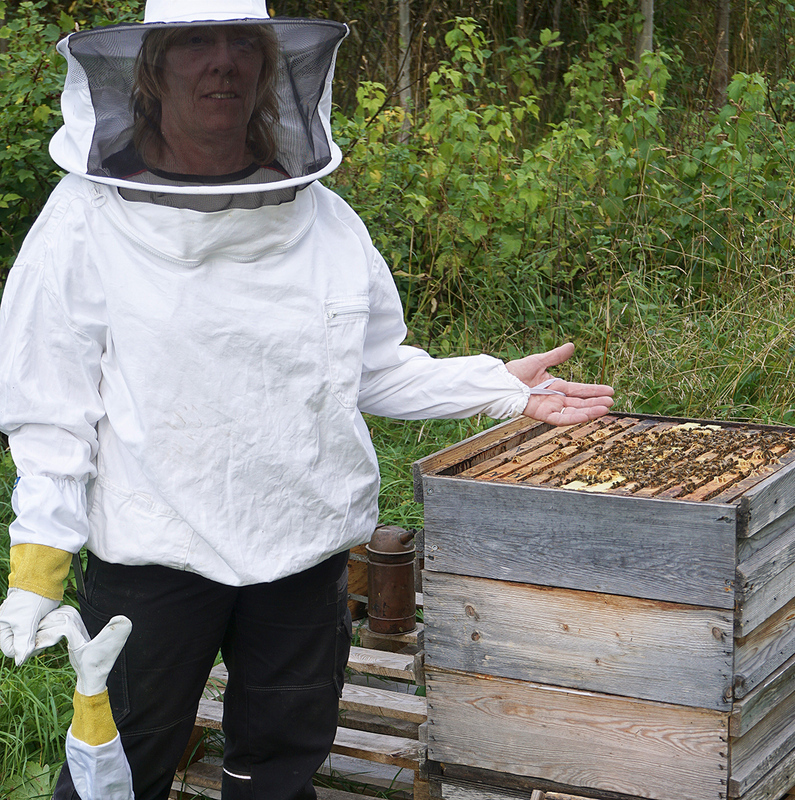 It’s quick and you get an answer directly in the apiary. You can communicate with the producer Bjorn Gagner through e-mail: bjorngagner@gmail.com Price is probably somewhere between SEK 100-200 + shipping (about EUR 15 + shipping). 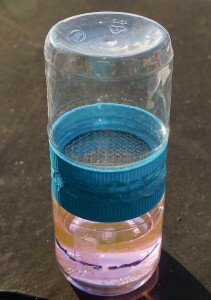 The shaker is meant for making a an alcohol wash test. 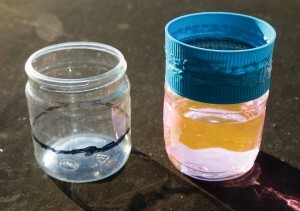 Fill one of the 500 ml jars to 2/3 with for example methylated spirit or rubbing (isopropyl) alcohol. 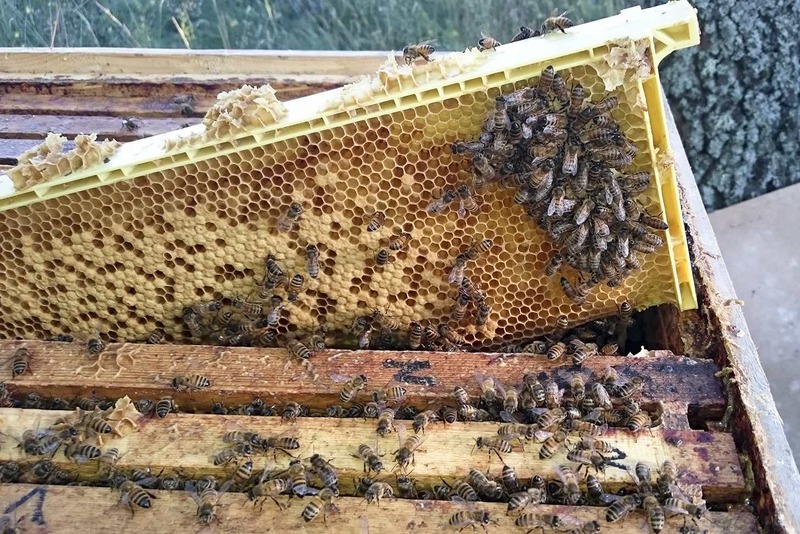 Take a frame closest to a brood frame, don’t include the queen! She’s most probably walking on a brood frame. Shake the bees from the frame into a bowl or pan. 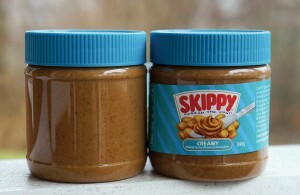 Screw the glued lids with the netting and the the two jars together and shake for a minute. Turn the jars upside down and continue shaking until all alcohol has come down into the former empty jar. Lift the cans above your head to the sky and count the number of mites on the bottom of the lower jar (which now has the booze). 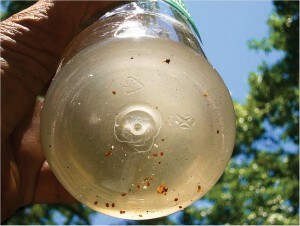 If it is less than 3 mites in May and 6 in August you will probably do nothing about the mites. If one decides to treat, you can use several methods. 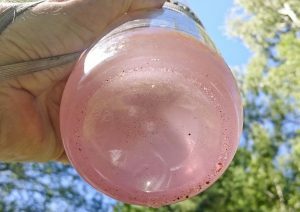 One method is to use thymol. Another to remove all capped brood frames (worker- and drone brood) twice with a week apart. The latter method is perhaps the one to prefer if you breed varroa resistant bees. Because then you interfere the least with the epigenetic adaptation of the bees to fight the mites. ‘The Beeshakers’ would be a good name for a pop/rock/soul-band/group, wouldn’t it? Why not a group of beekeepers that have control of their bees and the Varroa infestation? Regardless of if you are on the path of becoming treatment free or treating with whatever to get rid of pathogens and parasites in your hives (and creating other problems probably along the way – that goes for both groups unfortunately). Agree we can that the world would be a better place for bees and men without killers. That’s why treatment free is the goal! 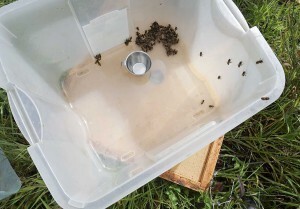 A year ago I wrote about the bee shaker: http://www.elgon.es/diary/?p=354 Here are some more tips how to get control of the Varroa situation in the hive. When a colony has problems you can speculate and discuss about how many mites there are in the colony. If that’s why the colony is dwindling. With a high number of mites often follows virus problems, more sensitivity to plant protection chemicals and more susceptibility to Nosemas, and all of this together in a spinning wheel. 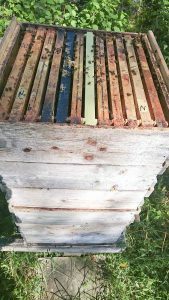 You can know the mite infestation much better with this simple method that is quick and done on the spot in the apiary, with some training in a few minutes per hive. I used two plastic bottles containing peanut butter of the brand Skippy, a bee tight but not varroa tight netting, mesh size 3 mm, a plate shears, a proper sized hole saw (in this case for a 60 mm hole) and a soldering iron at 80-100 watts. Get rid of the peanut butter and wash the bottles. Saw holes in the lids. 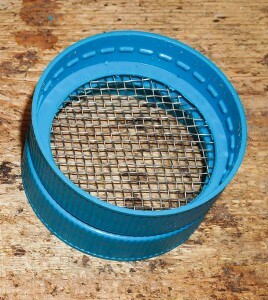 Cut a piece of mesh so it fits inside the lids and covering the hole. 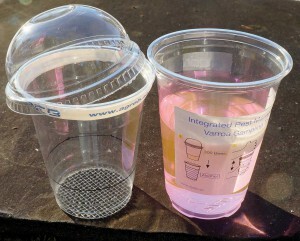 Put one of the lids on a table, then the piece of mesh, finally the other lid upside down. Keep it all together with one hand (or some one else’s hands). 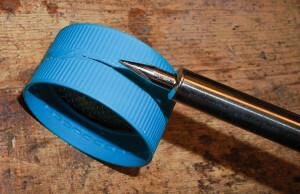 Solder the caps with the piece of netting in between. Don’t take bees close to the entrance. They have bad correlation to the real amount of mites in the colony, fewer mites on those bees. Take bees relatively close to the brood, but not from a comb with the queen (poor queen if she should end up in the shaker). You may well take bees from a comb without brood, but close to the brood. 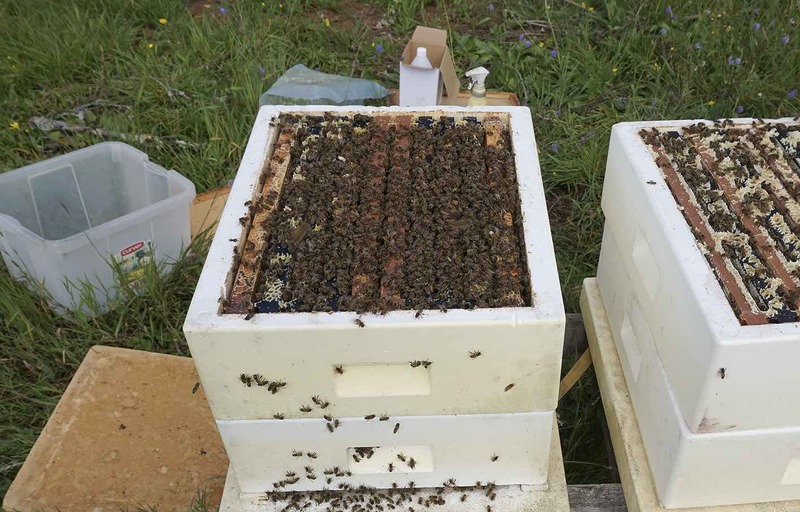 In the upper brood box is a good choice if you use two brood boxes. Check for the queen! Avoid the outermost comb in the box, unless brood is close and it’s filled with bees. Most secure and quickest is if you use queen excluder and you have super(s) above it (depends on the season of course). Take bees from the center of the first super close to the excluder. Take the jar with the black line (black color doesn’t fade so easily by the sun), hold the opening close to bees on the comb and move it from below upwards. Bees will tumble down. 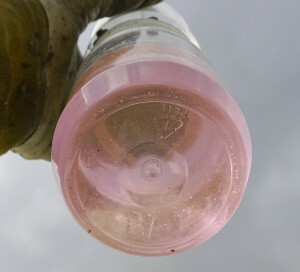 Hit the bottom of the jar gently against something sometimes so that the bees will be shaken down on the bottom. You then see easier when you have enough of them. Before this procedure you have poured 2 deciliter of some kind of high content alcohol fluid into the other jar. The soldered caps are on top of it (there’s a hole you know you can pour through). Pour the alcohol into the jar with the bees. They die. Screw the lids with the other jar onto the jar with the bees and the alcohol. Shake it for a minute, not too hard and not too soft, “lagom” as we say in Sweden (a frequently used word when you don’t know what word to use). Turn the shaker upside down. The alcohol and the mites will go down. The bees stay above. Lift the shaker up towards heaven. The light will shine through and you can count the mites. (Live mites now killed will sink to the bottom. 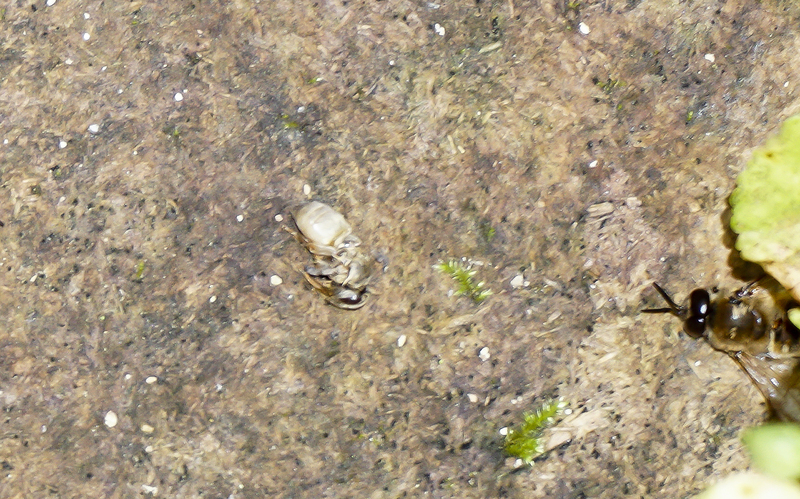 Dry mites from natural downfall will float. Just want to make clear the difference.) 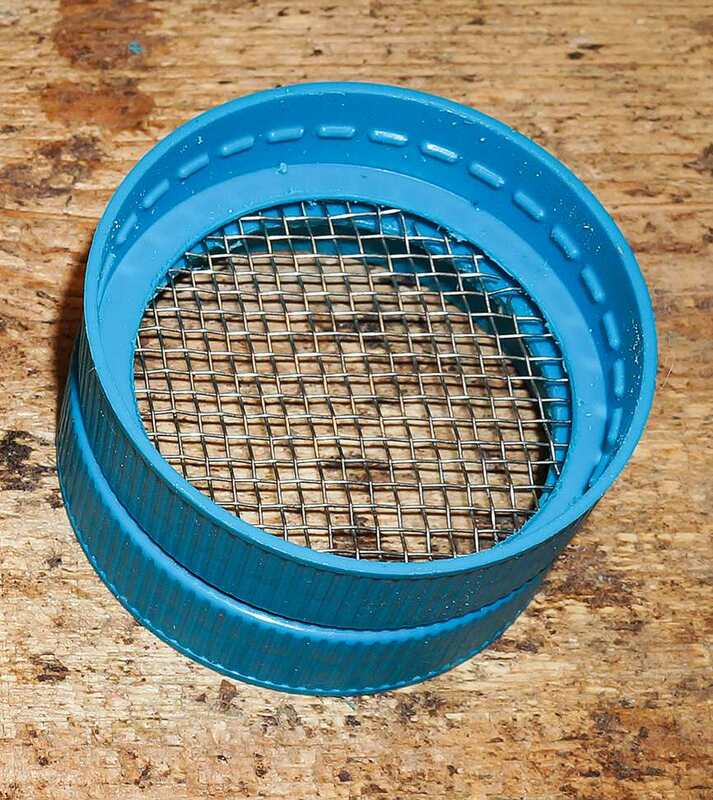 Recycle the alcohol through a fine mesh into the now empty jar to get it ready for the next hive. You may find 9 mites on your 300 bees (which you DON’T have to count, it’s enough with the calibration done to get an enough good estimation of the mite infestation). That’s 9/300 = 3/100 = 3% infestation. You can find that small or big, depending on when you did the measurement and what you are up to. Maybe you are in the middle of a breeding program for Varroa resistance. Maybe you want to find out when to treat, so you will not treat to late, or making an unnecessary treatment. In spring, especially in a breeding program for resistance, you don’t want 3% infestation. If you’re in a breeding program you will probably take another measurement a month later. 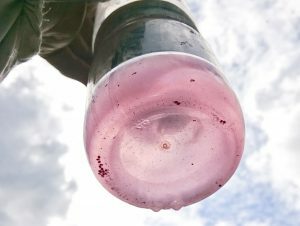 If you’re not, you maybe want to treat now, if you find something that’s good using in spring (there’s really only one option here that is least damaging in different respect, thymol). If you get 3% after the main crop in the middle of July or in the beginning of August (or September maybe), you may decide not to treat if you’re in a breeding program. If you’re not and the bees will be without brood in November or December (on higher latitudes in Europe and Canada) and you plan to use Oxalic acid (which I don’t recommend for different reasons [though you’re the boss in your operation]) you may wait until then. 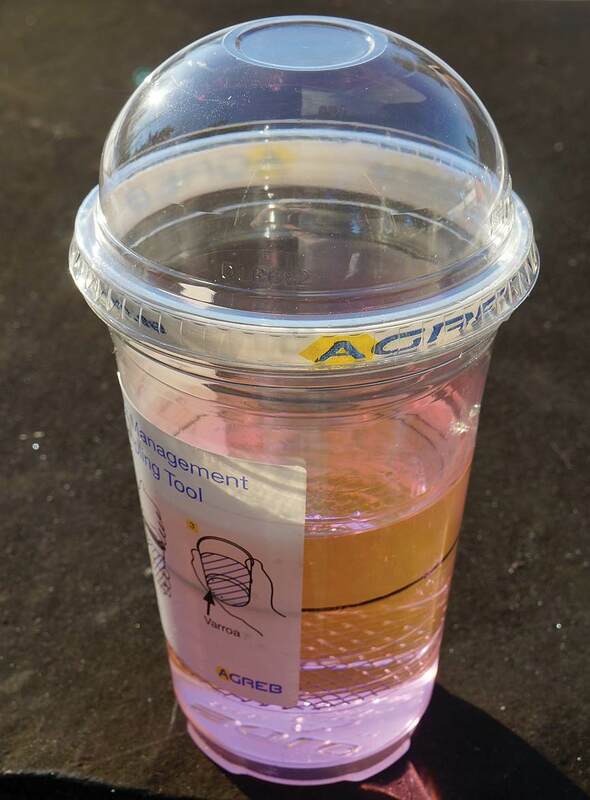 If you consider pesticide strips or Apiguard (Thymol) or Formic acid, you may decide for that now. If you get 3% in October, November just prior using Oxalic, you may decide not to use any Oxalic. Like a friend in our resistance breeding program here in Sweden. He has the limit 5% for deciding when to treat. All colonies below that limit don’t get any treatment with him. If you treat all your colonies whatever figures you get in your measurements because you hate the mites that much, you get at least figures you can use in selecting the ones with the highest numbers. Those are the ones that should have their queens shifted in some way. 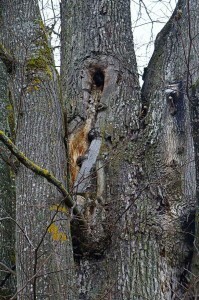 But the bees in the tree survived the winter and was thriving this year too. The swarm was last year strengthened with a couple of brood frames from his other colonies. It was not treated against varroa last year. 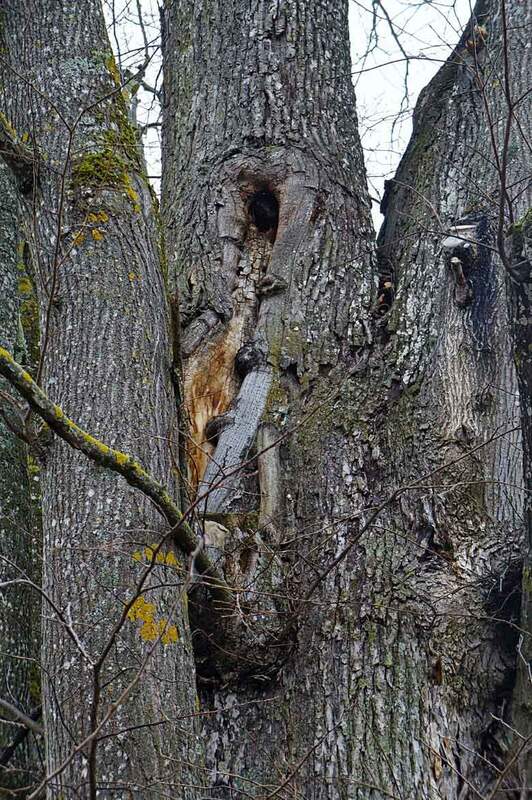 It survived winter well. This year it was used as his other colonies to produce splits for sale. A couple of weeks ago he was too curious about the amount of mites in the colony so he gave it 15 grams of thymol and collected the downfall. After a week 150 mites. Under the circumstamces it’s not much at all. The bees must have some kind of trait that keeps down the number. He has had thousands of mites falling in a few odd colonies in earlier years with such a treatment – as comparison. Normally he just give his colonies 15 grams of thymol, but in the middle of August. As the only treatment in a year. He has Elgon bees and uses 4.9 mm cellsize. His winterlosses is always below 5%. Next year he plans to breed from this colony as it is a very nice one.